UPDATE (10/12/14) - It looks like the standalone VMRC is currently not available for download just yet. You can continue using the existing methods to connect to your VM Console, the new Standalone VMRC is NOT required but the links have been put in place to proactively get ready for NPAPI deprecation (more details below). You can subscribe to VMware KB 2091284 which will be updated when the download is available. The deprecation of NPAPI support is nothing new and has actually been communicated by all major web browsers for quite some time now. To ensure that VMware customers are not affected when this change goes into effect, a new standalone VMRC is being introduced to preempt the upcoming change and provides a new way of launching a VM console using the vSphere Web Client as seen in the screenshot below. To be able to open a VM Console using the new standalone VMRC, you will of course need to have it installed first. 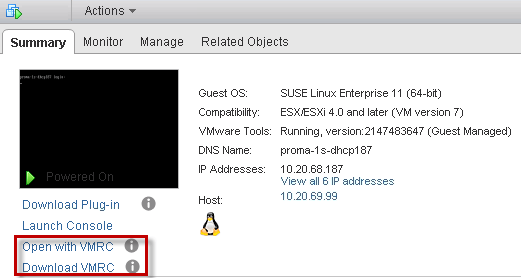 You can find the link to the download on VMware.com but there is also a direct link provided on the VM Summary page in the vSphere Web Client. In addition to the new standalone VMRC, you will still be able to use the existing method as well as the HTML5 based VM console. The HTML5 console continues to work if you do not have CIP (Client Integration Package) installed on your Windows system or if you are running on a Mac OS X system. I am sure many of you are probably asking when will there be Mac OS X version of VMRC? I know I definitely am 🙂 The good news is that this is being worked on and hopefully we will see a Mac OS X version in the very near future. The second method accepts a vCenter Server session ticket which you can generate by using vSphere API acquireCloneTicket() method. A quick way to test this example is by using the vSphere MOB and making a call to acquireCloneTicket using the following URL https://[VCENTER-SERVER]/mob/?moid=SessionManager&method=acquireCloneTicket and then specifying the ticket as seen in the example below. With the new URI handler, you can automatically associate it with the standalone VMRC application which means you can type this into a browser or into a Windows explorer and it will automatically launch VMRC. The other nice thing about the new standalone VMRC is if you would like to reduce the complexity of getting a regular use connected to their desktop, you can easily use the standalone VMRC and dynamically generating a link for your end users to access their VMs without ever exposing them to the underlying vSphere infrastructure. I suspect there will be some really interesting use cases for the new standalone VMRC and the VMRC team will continue to iterate to make it better based on customer feedback. Cool solution! It would be cool if this could be tunneled somehow.. It looks like the direct link to VMRC (http://www.vmware.com/go/download-vmrc) is dead again this morning. It worked last night, but this morning it redirected to the KB article. I was thinking Linux VDI on a small scale. Of course no sound. About the timeframe of the vmrc for Mac OSX, do you have any insight of how soon? This year, spring 2015, Q4 2015, this decade? Also do you know if there is a beta program for it? Its very frustrating to hear OSX console support will be in the next release for vSphere, only to have another product like vCAC released without console support. Hi Dave, we’re targeting a 2015 release for VMRC for Mac. It won’t have a formal beta program, but we’ll let you know as soon as it is released on http://www.vmware.com/go/download-vmrc. 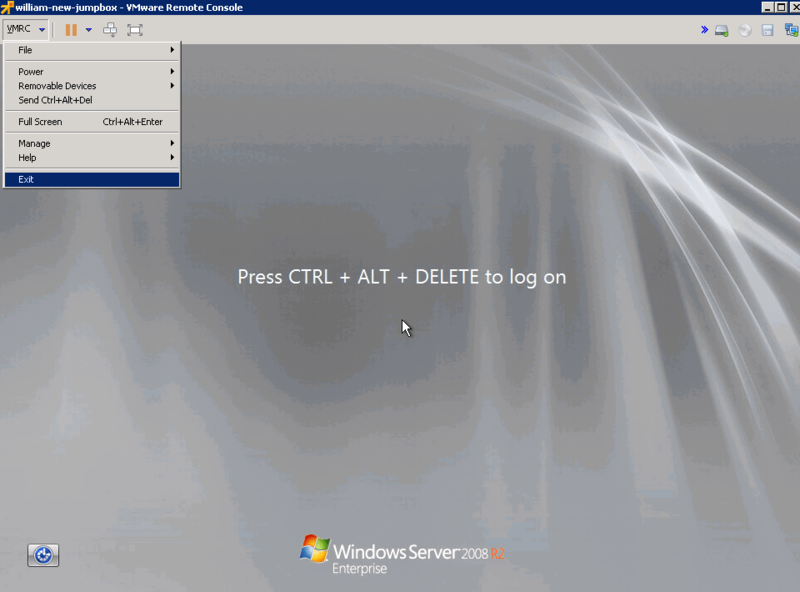 vCAC will be released with console support, but in a slightly different way. It will be an HTML console that has more basic mouse-and-keyboard functionality. VMWare Fusion 7 Pro for Mac is actually able to open the VMRC links, you can even connect directly to VCenter or an ESXi instance from Fusion Pro nowadays! I had no idea, and only accidentally ran into this feature when reconsidering which VM solution to use for Windows Phone development. Hey, thanks for the Informations…. But i have to type in the VM password, is there any posibillty to do this step atomatically? I know the way by using the vmware-vmrc.exe …. But we have to use the remote console. I’m running in the same situation too. I stored the credential in the xml file. In my powershell script, I load my credential object but when running the vmrc.exe command, how can I pass the password in the commandline? passing a password as a command line parameter is a dangerous technique, any user checking the task manager would see the parameters and thus the password provided in clear text. never ever do it like this!! This is working great! if they added the ability to pass through domain creds of the current user (like the web interface of vsphere) it would be perfect for my use case of VMs for some of my users. I’ve been looking all over for the URI methods you posted in their very messy documentation centre to no avail. Could you kindly post a link to where you got that information. I believe I got this by just running –help on the vmrc.exe which provides the help menu. – The host’s monitor layout has changed since the virtual machine was powered on. You must power the virtual machine off and back on to use multiple monitors in Full Screen mode. Have You solved the mulit-monitor problem? We also tried to get it work, but no success. Good morning, I am a newbees in VM. I have installed ESXi in my HP54L micro server for running VM Linux and W. The version that I have installed is version 5.5.0 Build 1746018 for ESXi. So could you tell me if with this one I can connect to VM in HTML5 ? If yes, which tuto shall I follow ? Thanks for your help. can u provide the current download link for the vmrc ? i couldnt access the link specified..
Hi i posted a question on the 3rd of May could you help me ? I want to open vcloud director console..is it possible to use the stand alone vmrc for vcloud director console ? William, you answered my question long before I posted it! Like many time-travel movies 🙂 I see that the ESXi host MoRef of a VM may change however, VCenter MoRef for VMs do not. I found your post here (http://www.virtuallyghetto.com/2011/11/when-do-vsphere-morefs-change.html) which answered my question 🙂 Present thanks for a past deed! Cheers…. how to limit permissions on vmrc ? Is it possible to use VMRC without VC? F.e., in free VMware edition. I used vmrc://clone:[VC-CLONE-SESSION-TICKET]@[VC]/?moid=[VM-MOREF-ID] to launch VMRC app. But VMRC still prompt me to enter the username/password for vCenter. Is it expected? I thought CLONE-SESSION-TICKET is for login, then no username/password is needed. The vmrc url works today. No idea why it didn’t work yesterday… Thanks. The clone session ticket is for a single use and expires within two minutes. Is it possible the ticket was stale? If the clone ticket fails VMRC will fall back and prompt you for a username/password. Is there any way to get this to work in vSphere 5.1? I’ve tried but I get the error. I’m using vmrc on v6u2 but my function keys do not pass (F2, F11 ) both required to install / manage esxi on a vm so what is the trick to get f2/f11 to pass from my windows desktop to vmrc? I’ve tried i.e.11, chrome, Mozilla but none using vmrc 8.01 & I tried repairing vmrc via reinstall but I cannot get f2 / f11 to pass from my desktop to the vm. also just confirmed that [VMRC.exe available free](https://www.vmware.com/go/download-vmrc) also works with same arguments… they both appear to launch vmware-remotemks.exe, presumably the core workhorse… brief observations shows vmrc.exe has a slightly smaller memory footprint than vmware.exe (Workstation) but nothing significant. apparently the VMRC install is not side-by-side friendly with other clients (e.g. vSphere Client and VMware Workstation) failing with a “Failed to install hcmon driver” error… KB 2130850 confirms as much… yet i found once it’s installed somewhere else, i could copy the resulting “Program Files (x86)\VMware\VMware Remote Console” folder to desired machine and it ran happily alongside those other tools… so it is just the install which is incompatible, not the vmrc runtime itself. Re HCMON conflict: This VMware Communities thread discusses the issue: https://communities.vmware.com/thread/517717 . One solution is to run the installer with admin privileges. There are also several HCMON KBs for VMRC and other products. This is an issue with Workstation 11 and earlier–it installs cleanly alongside Workstation 12.
awesome, run installer as admin avoided the hcmon issue – thanks! There is no launch-time option. Any permissions would need to be configured on the server. Great post — very helpful — thanks! I’m trying to get this working in a non-vCenter environment — just a few ESXi hosts running 6.0.0. I’ve got the MOIDs directly via SSH, and the app is successfully installed, but I keep getting a “connection timed out” message. Does this option REQUIRE the use of vCenter as an aggregator to work? Or am I perhaps missing something else? You don’t need vCenter. What’s the full “timed out” message? Is it a pop-up dialog? What kind of failures show up in the log file? Given MOIDs you can connect to ESXi 5 if you like. ESXi 6.1 (not sure how far back it goes) has its own web UI that generates vmrc:// links– go to https://your_server/ui/. Is this solution dead as it’s no longer available for download. Hey guys, the http://www.vmware.com/go/download-vmrc link has been fixed and now points to VMRC 10.0.1 again. Let us know if you run into any more issues! Hi, Thanks for the quick reply, I just downloaded this morning with no issues. Anyway, great start of week to come across your great article on how to solve this, when I just got that thought of it 3 days ago and did not loose much time finding for solution! You and all have a peaceful year 2018!